Petroliam Nasional Bhd (Petronas) is Malaysia’s national oil company holding exclusive ownership over the country’s oil and gas resources. In the upstream sector, Petronas enters into productionsharing agreements with other local and foreign upstream players to explore and develop Malaysia’s oil and gas resources. Petronas also dominates the downstream businesses, although other regional and international players also have significant downstream presence in Malaysia. The major petrochemical companies include Petronas Chemicals Group, Lotte Chemical Titan, Toray Group, Kaneka Corporation, and Idemitsu Kosan. Shell, Chevron with its Caltex brand and Petron are the foreign players in the domestic fuel retail business. The leading local oil and gas services and equipment (OGSE) players include Sapura Energy, Bumi Armada and Serba Dinamik Holdings, which also have growing international presence. 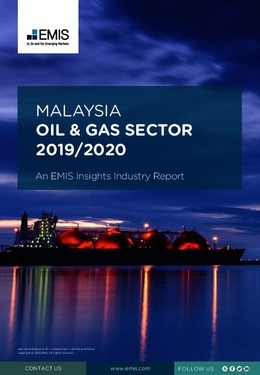 This report provides a complete and detailed analysis of the oil and gas sector for Malaysia. EMIS Insights presents in-depth business intelligence in a standard format across countries and regions, providing a balanced mix between analysis and data.